This item is no longer available. Please see item # 300127. 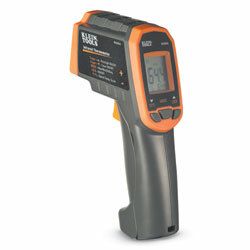 Take the guesswork out of traditional infrared thermometer readings with Klein’s dual-laser infrared thermometers. The spacing between the two lasers accurately shows you the surface area being measured. Additional features include a backlit display‚ auto shutoff‚ and a handy worklight for dark areas. Includes: case‚ Type K thermocouple and two AAA batteries.